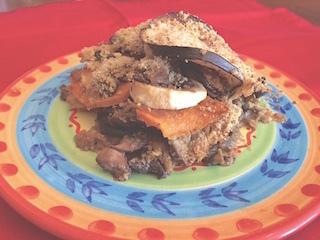 Full of flavor and easy to make, this casserole uses slices of sweet potatoes, eggplant and parsnips layered with sautéed mushrooms, onions and vegan mozzarella to create a sweet and savory burst of deliciousness. Its hearty enough to serve as a main dish but perfect as a side dish as well. It also seems to get even better as a leftover! It’s colorful and full of nutrients—-the kind of winter meal that warms the insides! Preheat the oven 400 degrees F. Lightly spray a large round casserole dish. Lightly spray 3 large baking sheets. 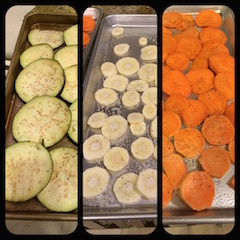 On one of the baking sheets, lay out the sweet potato or yam slices. Spray the potatoes lightly with the olive oil spray and season to taste with garlic powder, salt and pepper. On another baking sheet, lay out the eggplant slices and spray lightly and season with garlic powder and salt and pepper. on the 3rd baking sheet lay out the parsnip slices and season the same way. Put the 3 baking sheets in the oven and bake for about 12-15 minutes, until all the vegetables are soft and very slightly golden. In a large frying pan, heat 2 teaspoons of water on medium high. Add the chopped onion, cover and cook until translucent, about 5-8 minutes. Add the mushrooms, minced garlic, tamarin sauce and thyme. Cover and cook for about 5 minutes until softened and golden. set aside. Once all the vegetables in the oven are done, remove the baking sheets from the oven. 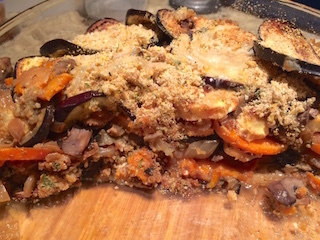 In the sprayed casserole, first place a layer of the eggplant slices slightly overlapping. Spread a layer of the onions and mushroom mixture. Top with vegan mozzarella cheese. Place a layer of sweet potatoes or yams and then a layer of parsnips. Then spread the onion and mushroom mixture. Top with vegan mozzarella cheese. Repeat until all the ingredients are used. Bake for 30 minutes. Meanwhile, in a bowl, combine the bread crumbs and nutritional yeast. Add the teaspoon of olive oil and stir to blend into a paste. Sprinkle on top of the casserole and bake for an additional 10 minutes, making sure it doesn’t burn. Serve immediately. Note: Instead of yams or sweet potatoes, regular yukon gold potatoes can be used, unpeeled, for a different, more savory taste. This dish can be made ahead—refrigerate after baking and before the bread crumb topping goes on. Then, let it sit until it returns to room temperature and bake with the topping for 10 minutes.